The Optimus G comes with the usual set of organizing apps and there's a preloaded document viewer and editor. 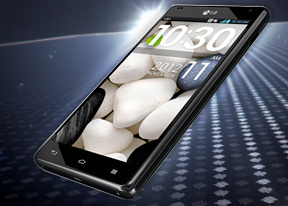 The LG Optimus G features an alarm clock application, which allows as many alarms as you need to be set, each with its own launch time, sound and repeat pattern. You can enable application link, so the calendar/email/music player/ tasks/weather app launches after the alarm goes off. The so-called QuickMemo function is integrated in the phone's OS, allowing you to capture screen shots of anything (including the lockscreen!) and scribble notes over them like you would on the LG Optimus Vu. A simultaneous press of the up and down buttons of the volume rocker will take the screen shot. There are also Yahoo-powered weather, news and finance apps - any issues you might face with those can be resolved by downloading one of the many alternatives from the Play Store.